Floating action menu is new concept which is used in mobile apps and websites. Nowadays some popular sites and apps have used floating action menu including inbox. It is used for quick action with multiple options like uploading photo, video, writing note etc. Floating action menu is useful for note taking application. 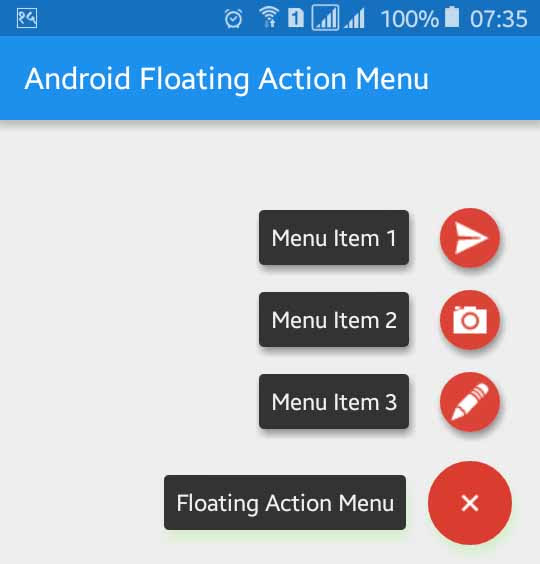 In this tutorial, you will learn to add/implement material design floating action menu in your android application or game. Using floating action menu helps to make clean and to increase content space in mobile app. One button is visible and when users click that button, other action buttons will appear there. This is simple task just you have to add some floating action buttons and make it as menu. Let's start by adding compile 'com.github.clans:fab:1.6.2' dependency in your app build.gradle file. Build.gradle file will look like below. Open your app XML layout file and add following XML code. Here, we controlled all about action menu item onclick. Following is the complete modified code of java activity file and you can add action to onclick listener according to your requirement. Now, run your Material Design Android Floating Action Menu Example application and click to the plus button then some other buttons will appear just above that plus button like the above screenshot.